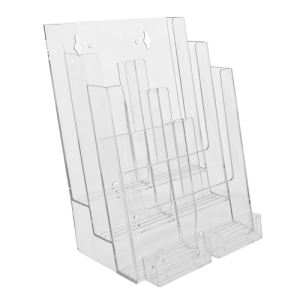 Counter / wall mount, a three tier multi pocket brochure holder with two card pockets attached. 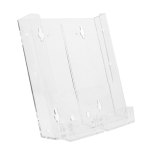 This versatile display allows you to have several custom configurations of pockets that are 9” wide and 4 3/8” wide in one compact display. The two attached card holders complete this affordable, efficient display. Convenitently show off your literature at conventions, in class rooms and libraries. Perfect fit for leaflets and brochures 8 1/2'' wide and 4 1/2'' wide with cards up to 3 1/2'' wide. This unit is a great addition to parts counters, high traffic areas, tourism offices, information kiosks, medical offices and waiting room.